30 Bucks a Week), has suggestions for what, when, where, why, and how to shop for groceries without hurting your wallet or deadening your palate. Some of their suggestions are easy (buy in bulk; don't buy overpriced prepackaged stuff), while others are trickier (coupon-cutting and sales-timing aren't for everyone). So here's our quick take on the problem: Plan your shopping around types of dishes instead of ingredients, and you'll feel less overwhelmed. You can add small amounts of meat or other protein to all of these dish categories, or not — it's up to you. And hey, most of these meals make leftovers, too. #(clear n2). 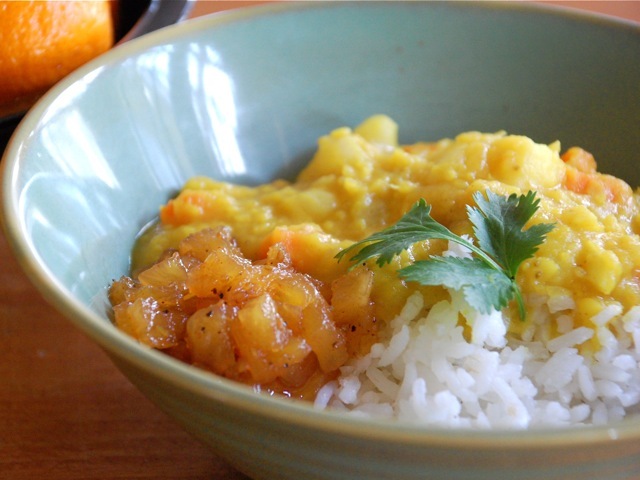 [%image dal float='clear right' width=350 caption="Dal, chutney, and rice"]Rice/grains. 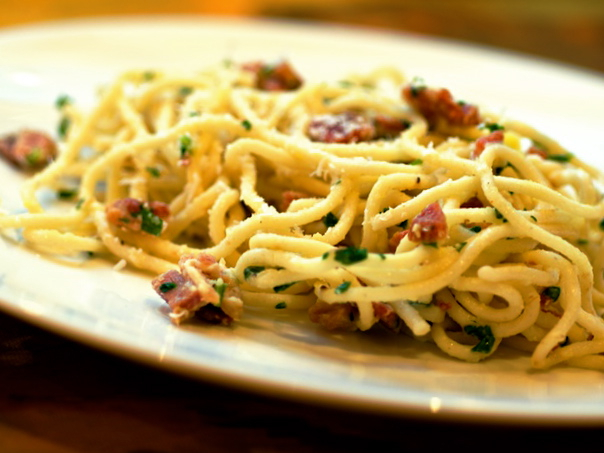 Only moderately trickier to cook than pasta, rices and whole grains are ridiculously cheap and provide a variety of nutrients. Again, you can dress them up however you like for a meal in a bowl. #(clear n3). 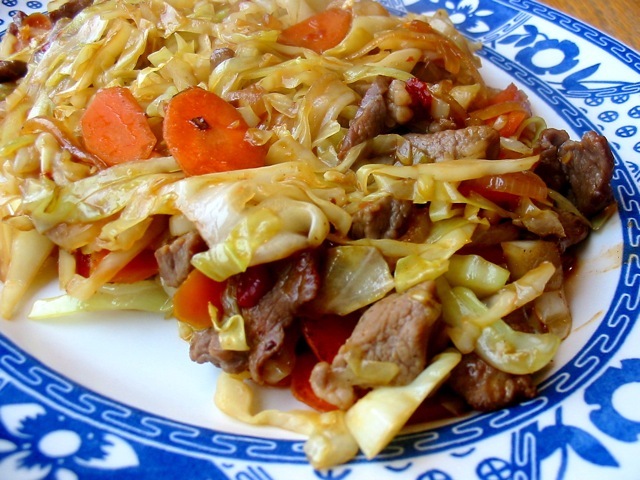 [%image stirfry float='clear right' width=350 caption="Stir-fried carrots, cabbage, and lamb"]Stir-fries. Nervous about hot woks and getting all those different ingredients to cook correctly and quickly? Don't be; just check out Matthew Amster-Burton's column on stir-fry technique, and you'll be mastering the concept in no time. #(clear n4). 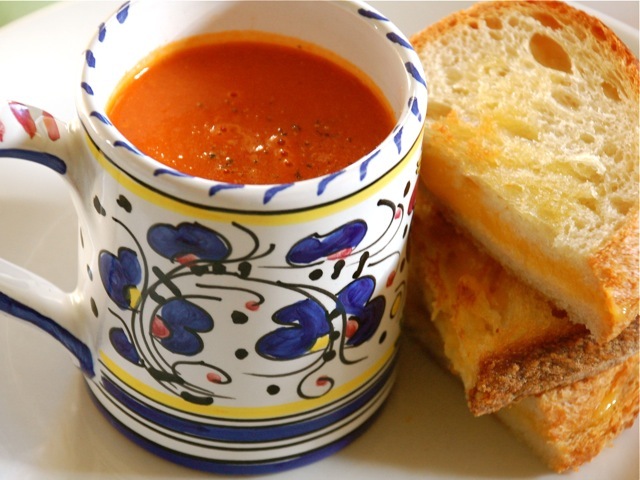 [%image soup float='clear right' width=350 caption="Tomato-orange soup"]Soups. Easy to make in vast quantities, and tasty all year round (gazpacho, anyone? ), soups are a classic budget meal: savory liquid, supplemented with salad and bread. #(clear n5). 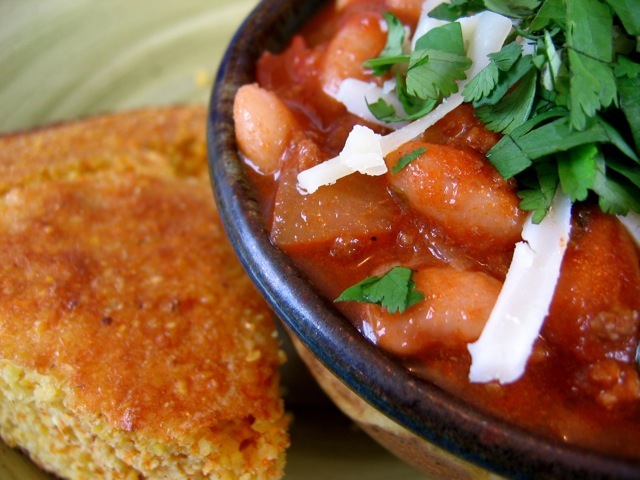 [%image chili float='clear right' width=350 caption="Chili con carne with cornbread"]Stews. Heartier than soups, stews (sometimes better described as braises) usually involve chunkier ingredients and, if you're meat-inclined, far more animal protein. But you don't need much meat for a stew, if any, and the little you do need generally comes from the cheap end of the butcher counter. #(clear n6). 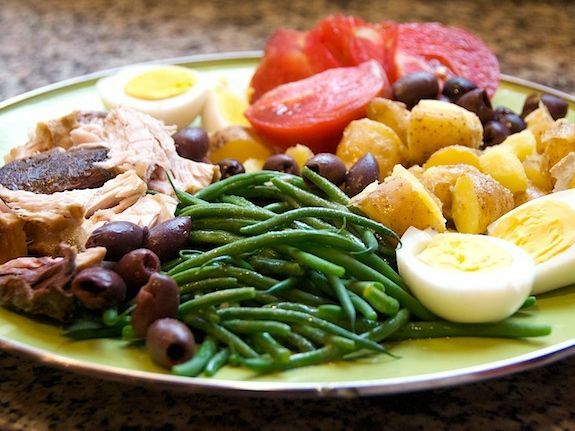 [%image salad float='clear right' width=350 caption="Salade niçoise"]Salads. You might not want a salad for dinner in the cold, dark winter months, but in the summertime? Perfectly refreshing and sustaining without making you sweat. Make a hearty vegetarian salad (like Jane’s Great Salad) or try one of the three meaty salads below. #(clear n7). 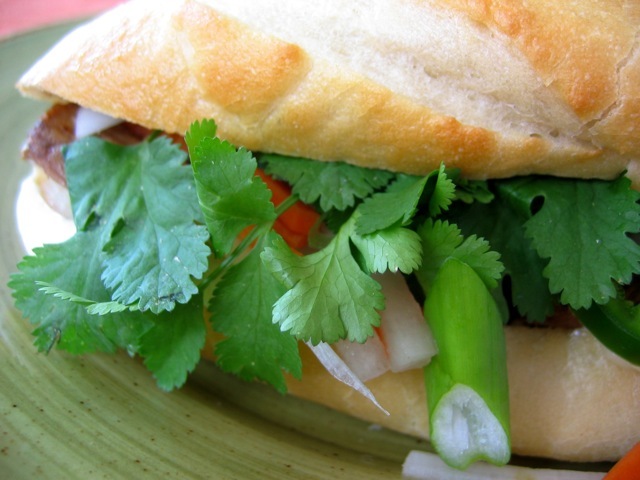 [%image sandwich float='clear right' width=350 caption="Banh mi"]Sandwiches. Sure, many of us have packages of deli meat and cheese stashed in the fridge for easy school and office lunches. But plan ahead a little bit, prep your own ingredients, and you can have intriguing sandwiches any evening of the week. Cold is fine, but many sandwiches are even better when served hot. #(clear n8). 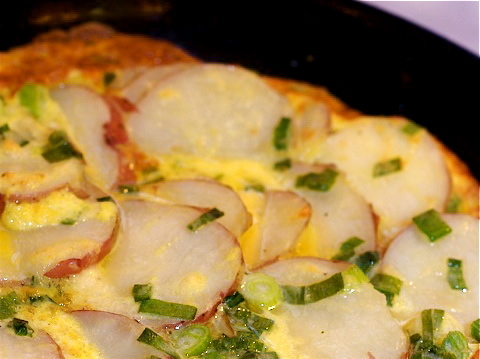 [%image frittata float='clear right' width=350 caption="Potato frittata"]Eggs/breakfast for dinner. This, of course, is the hands-down kid favorite: Pancakes for dinner! But you don't have to stop at serving breakfast classics in the evening; plenty of other egg-based dishes, such as frittatas and quiches, provide cheap protein alongside delicious dining.